The summer of 2014 was a simpler time. Donald Trump had not kicked off his presidential campaign, The Kid was still in Pre-K, the collection of beers in my basement was about one-quarter of its current size, and I had enough Marriott Rewards points to cover four nights at a Midtown hotel for The Wife and I to take a long weekend in Manhattan. It was during this trip that I had two of the greatest culinary experiences of my life: Colicchio & Sons and Gato. Gato was a game-changing event for me, as you can read in my review linked above. Everything on that menu is a risk. The kale and mushroom paella with the fried egg. The piquillo pepper pesto. The lamb sausage with mint. It was nonsensical yet the flawless execution of each dish left me speechless. Bobby Flay took a lot of chances with his Mediterranean-inspired menu, hitting every hairpin corner at 100 MPH precisely. As odd of a choice as it sounded, the scrambled eggs were a standout. Just-done eggs were mixed with a traditional romesco sauce and a soft Boucheron cheese. Served with a tomato confit toast, the roasted red pepper and almond from the romesco were dominant, but you could not escape the instantly recognizable flavor of goat cheese. When we ran out of toast, I used the spoon and at it directly from the bowl. 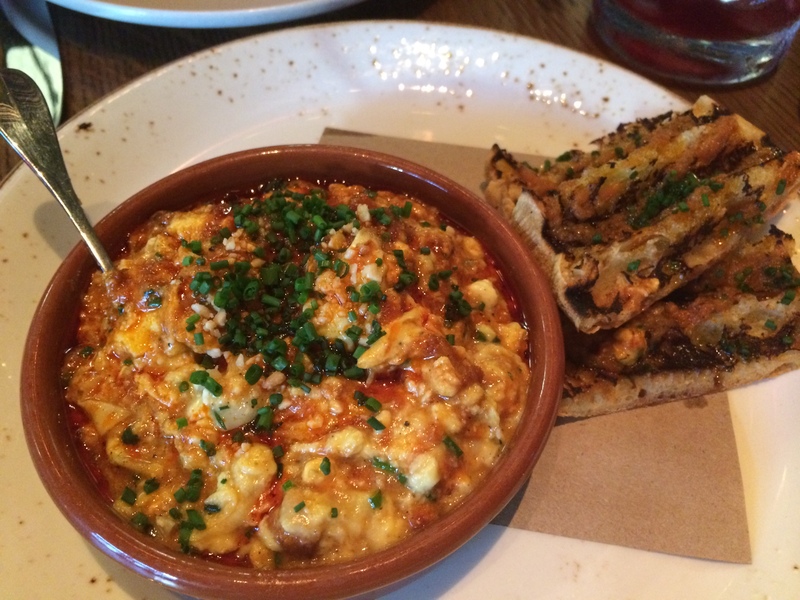 It was a simple starter combining eggs with a traditional Mediterranean romesco, but one could not get over how each flavor — the creamy, pungent cheese, the nutty almond, the sharpness from the red pepper — stood up on their own. It was like an Olympics track and field or figure skating competition. Each athlete, regardless of country, competes against one another, but are united by their nation’s flag. A little flowery, I know. I’ve longed for those scrambled eggs (and that paella) ever since. Like that high school girlfriend you never got over, I would go months without giving them a second thought, but then I would hear someone say “romesco sauce” and be transported to our table, the first from the server’s entrance to the kitchen, along the frosted glass wall at the restaurant in NoLITA. Three eggs are vigorously scrambled with butter and crème fraîche, just to the point where the mixture morphs into tiny, supersoft curds. A tablespoon of romesco sauce (almonds, garlic, olive oil, red peppers, dried chiles, bread, tomato, raisins) is folded into the eggs along with the cheese and chives just before they’re finished; finely chopped marcona almonds and more chives serve as garnish. As to process, I made a slight mistake with my base. I scrambled four eggs with 2 tbsp. of butter and 4 tbsp. of crème fraîche. Upon further review, I used too much of the latter ingredient, which prevented the “tiny, supersoft curds” from forming. Cutting that to 2 or 3 tbsp. would be sufficient. “Dried chiles” was not as specific as I would have liked. Ancho peppers tend to be low in heat and have a rich flavor that goes nicely with the charred red peppers and toasted ingredients. I added 2 tbsp. of that to the eggs after they cooked. Beyond that, maracona almonds are a little tougher find. Wegmans typically has them, but they were out of stock on grocery day. Such is life. I used dry-roasted, unsalted sliced almonds instead. If Gato’s version is a 10, I would rate these a 7 and I blame most of that on the crème fraîche issue. That said, The Wife and I finished this bowl of eggs the same way we did the first: with spoons scraping down the bowl. Next time, I might toss a guajillo into the romesco just to see how it changes the flavor. And, I will find those maraconas. On a large baking sheet lined with foil, place the almonds in a single layer on one side, followed by the bread pieces and the tomato. Roast 15 minutes, or until the bread and almonds begin to brown. Remove from the oven and set aside. Place the tomato in a small bowl and cover with plastic wrap for 5 to 10 minutes. In the meantime, toast the chilies in a small skillet or frying pan over the medium-high heat. The chilies will expand like a balloon while toasting. Turn them every 30 to 40 seconds to toast evenly but not burn. Remove from heat and submerge in hot tap water for 10 to 15 minutes. Drain from the water, trim the ends with a knife or kitchen shears, and remove the seeds. Set aside. Remove the tomato from the bowl, and peel and discard the skin off the fruit. Combine the bread, tomato, almonds, chiles, garlic, roasted red peppers, oil, vinegar and seasonings in the bowl of a food processor. Puree until there are no more large chunks of bread or tomato. Pour into a bowl and set aside. In a medium, high-walled mixing bowl, add the eggs, crème fraîche and butter. Beat vigorously with a whisk until the eggs and creme begin to form tiny curds. Heat a medium skillet over high-heat until bottom of the pan is so hot that you cannot hold your hand over it. Reduce the heat to medium and add the egg mixture. Let the bottom set, then scrape it up with a spatula. Flatten out into an even layer and let the bottom set again before scraping the pan. Repeat until the eggs are just cooked through. Fold in 2 tbsp. of romesco sauce, the boucheron cheese and half of the chives, cooking until the cheese has melted. Transfer to a medium serving bowl, top with remaining chives and serve immediately.